Montezuma is a history-themed game powered by WMS Gaming software provider. The game is a 5 reels and 30 paylines video slot with amazing free spins feature. 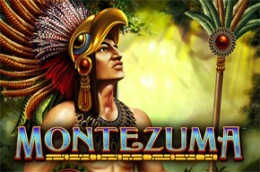 Montezuma offers to its players multipliers, wilds, scatter symbols and cash prizes. The game’s action is set into the deep wilds of Central America. The lower value symbols are the standard playing cards (J, Q, K and A), while the higher value ones are all jungle-related and they include a snake statue, an eagle, a golden mask, a green headdress, Montezuma himself and his wife. Montezuma is playable from as little as 30p a spin to £150 as spin. The wild symbol is represented by a pyramid and the scatter symbol is a big wheel.